The name Atkin has long been associated with the best in basic boats. If you are looking for "the right little boat" to build -- or have built -- or if you just like to dream over boat plans -- you'll be delighted with the wooden boat design collections of John (1918-1999) and William (1882-1962) Atkin, which are now being sold by John's widow, Pat. 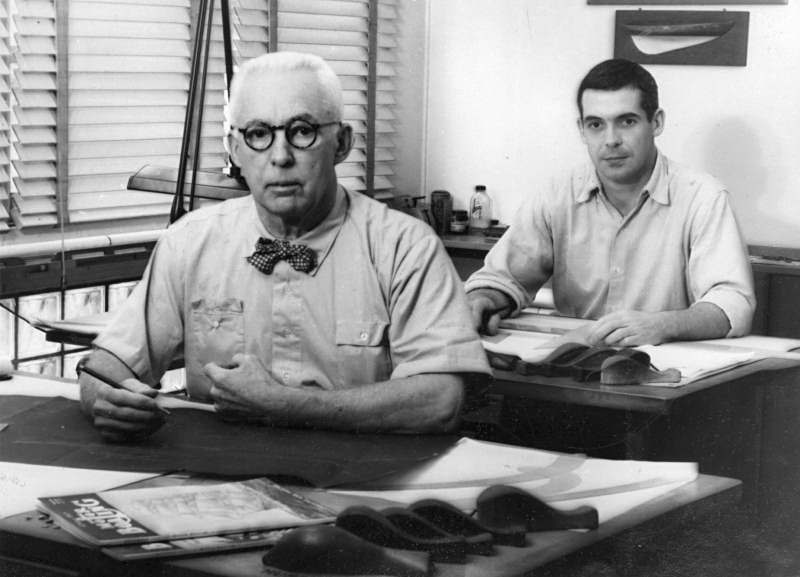 William and John Atkin in the office at Anchordown in the late 1940s or early 1950s. Having provided three generations with practical, well-proven wooden boat designs, our catalog offers more than 300 designs including famed Atkin double-enders, traditional offshore and coastal cruising yachts, rowing/sailing dinghies, utilities and houseboats. Many of the designs represent great simplicity and make excellent projects for amateur builders. Superbly drawn study plans, usually copies of the original "how-to-build" magazine articles by William or John Atkin, will help you choose the boat best suited to your level of boatbuilding skill. Complete designs include the lines; table of offsets; construction plan elevation and sections; arrangement plan elevation and sections; sail plan (or outboard profile); deck plan and numerous details as required. Scantlings are lettered on the working drawings. Also included are Xerox prints of the original "how-to-build" text as it appeared in the MoToR BoatinG magazine articles written by Billy and John Atkin. All designs require lofting before building. These plans contain all the information necessary for an amateur to successfully build a boat, but the older plans assume the builder has some familiarity with boat construction and the use of tools. Please Do Not stray from the plans and modify your Atkin boat. If you cannot resist the urge to second guess John or William Atkin you do so at your own risk; the resulting boat will no longer be an Atkin design and Atkin & Co. will take no responsibility for its performance! Just follow Billy Atkin's advice: "Now do not be tempted to pull the ends out, raise the sheer heights, swoop up the bow or stern, or do the many things a boat plan always impels one to do. Just put this... boat together and see how well she performs." Unless otherwise specified, construction is traditional plank on frame. Most of the flat-bottom boats can easily be converted to plywood planking. V-bottoms with straight sections may look like plywood will wrap easily around them, but but in reality, V-bottoms not specifically designed for sheet plywood may be very difficult, or impossible, to plank with plywood sheets. A new fully illustrated 135 page Catalog with more than 300 Atkin designs is available for $25 in the United States and Canada ($32 US for overseas orders). We now accept and use PayPal as a payment method! Just email the proper details with the completed order form and we can send an invoice. Please use our print-out order form to request a Catalog. NOTE: Due to lack of popularity, and workload, study plans are no longer available to be purchased as a stand-alone option. Join the ATKIN BOATS group on Yahoo to discuss Atkin designs and boats built from them.